One of the worse things that can happen to a computer is a Hard Drive crash. This can happen suddenly and without warning. But all is not lost and we can help. At A.D. Tech Solutions, we can do an initial scan of the drive and attempt recovery of your lost data. But, if the damage is too severe, we will refer the drive to Gillware Data Recovery. Gillware is highly successful in recovering data from all types of Hard Drives: From Laptops, Desktop, Servers or RAID configuration. Please stop in and see us, or click the picture below to start the process of getting your data back! 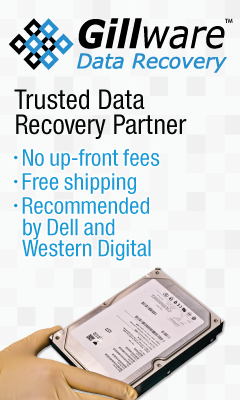 Recommended by major hard drive manufacturers like Western Digital as well as computer manufacturers like Dell. No up-front payments required. You will receive a free evaluation, recovery attempt, and listing of recovered files prior to paying service fees. Before Payment, you will see a tree-structure of all recovered files and be able to make an informed decision of whether or not we were successful in recovering your data.